The IBM Cognos Analytics 11 (ICA 11) user interface and platform functionality were not designed with Portal Pages and Portal Tabs in mind. 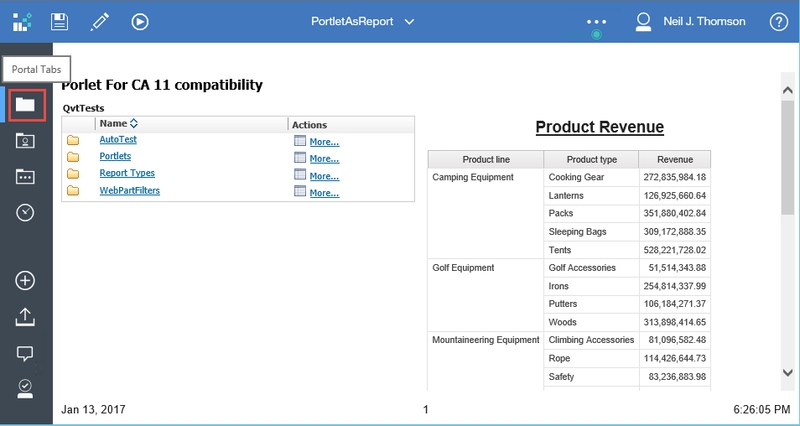 However, by using Reports with HTML items, the new UI “Extensions” capability and the “Legacy Portal” we can effectively emulate the Portal Page of IBM Cognos 10.X functionality in ICA 11.0.5+. This includes setting a Portal Page as a Home page, including setting them by user Role in the ICA 11.0.5 Admin interface. The screen shot, below shows a portal page shown in the ICA 11 UI as the Users home page, along with a Portal Tabs folder in the Nav Bar (which can be used select other portal pages).